[S6091] Tamara Brudenell-Bruce, "re: Brudenell-Bruce Family," e-mail message to Darryl Roger LUNDY (101053), 30 June 2012. Hereinafter cited as "re: Brudenell-Bruce Family." [S6] G.E. Cokayne; with Vicary Gibbs, H.A. Doubleday, Geoffrey H. White, Duncan Warrand and Lord Howard de Walden, editors, The Complete Peerage of England, Scotland, Ireland, Great Britain and the United Kingdom, Extant, Extinct or Dormant, new ed., 13 volumes in 14 (1910-1959; reprint in 6 volumes, Gloucester, U.K.: Alan Sutton Publishing, 2000), volume III, page 13. Hereinafter cited as The Complete Peerage. [S15] George Edward Cokayne, editor, The Complete Baronetage, 5 volumes (no date (c. 1900); reprint, Gloucester, U.K.: Alan Sutton Publishing, 1983), volume I, page 57. Hereinafter cited as The Complete Baronetage. From before 1607, her married name became Brudenell. After her marriage, Mary Tresham was styled as Baroness Brudenell of Stonton on 26 February 1627/28. 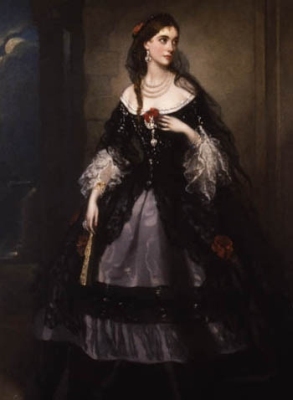 After her marriage, Mary Tresham was styled as Countess of Cardigan on 20 April 1661. From 5 August 1817, her married name became Johnston. From 19 June 1826, her married name became Brudenell. After her marriage, Elizabeth Jane Henrietta Halliday was styled as Countess of Cardigan on 14 April 1837. [S6] G.E. Cokayne; with Vicary Gibbs, H.A. Doubleday, Geoffrey H. White, Duncan Warrand and Lord Howard de Walden, editors, The Complete Peerage of England, Scotland, Ireland, Great Britain and the United Kingdom, Extant, Extinct or Dormant, new ed., 13 volumes in 14 (1910-1959; reprint in 6 volumes, Gloucester, U.K.: Alan Sutton Publishing, 2000), volume III, page 16. Hereinafter cited as The Complete Peerage. [S6] Cokayne, and others, The Complete Peerage, volume III, page 17. [S6] G.E. Cokayne; with Vicary Gibbs, H.A. Doubleday, Geoffrey H. White, Duncan Warrand and Lord Howard de Walden, editors, The Complete Peerage of England, Scotland, Ireland, Great Britain and the United Kingdom, Extant, Extinct or Dormant, new ed., 13 volumes in 14 (1910-1959; reprint in 6 volumes, Gloucester, U.K.: Alan Sutton Publishing, 2000), volume III, page 17. Hereinafter cited as The Complete Peerage. [S39] Marquis of Ruvigny and Raineval, The Blood Royal of Britain: Tudor Roll (Baltimore, MD, USA: Genealogical Publishing Company, 1994), page 23. Hereinafter cited as The Blood Royal of Britain: Tudor Roll. [S6] Cokayne, and others, The Complete Peerage, volume III, page 16. [S2] Peter W. Hammond, editor, The Complete Peerage or a History of the House of Lords and All its Members From the Earliest Times, Volume XIV: Addenda & Corrigenda (Stroud, Gloucestershire, U.K.: Sutton Publishing, 1998), page 144. Hereinafter cited as The Complete Peerage, Volume XIV.